There’s nothing almond butter and a spoon can’t fix. Let’s get serious. The best part of baking cookies is eating the dough, but that whole raw egg thing is not so sanitary. 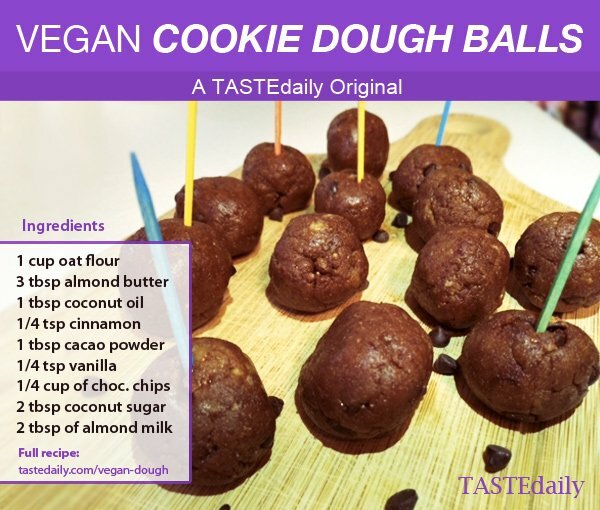 Enter, the vegan cookie dough ball. For times when you want something sweet – without sacrificing nutrients – have a dairy-free, gluten-free cookie dough ball. These tasty bites can be mixed and rolled up in about 10 minutes. Yup, you are only 10 minutes away from one. It gets better – these little bites have less sugar than your average protein bar (14 grams!). * Mix-up your cookie dough batter and roll into balls (add extra almond milk, as needed). * Sprinkle cinnamon on top. Turn it up a notch: Pop one of these babies in the microwave for a steamy treat. Makes 18 rich cookie dough balls! PS: It’s science! Did you drop your last chocolate covered goji berry on the ground? No worries. New research supports the infamous 5 second rule. Read more here.